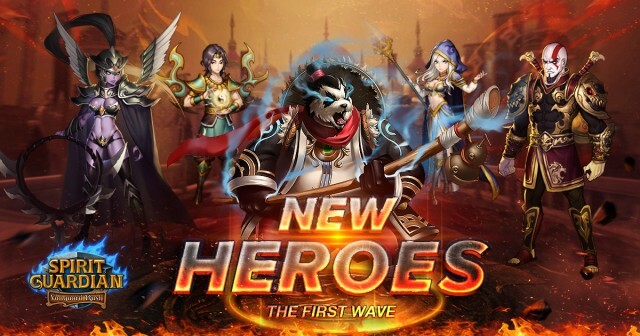 Spirit Guardian - Vanguard Rush, the free to play strategy RPG that is known for it’s huge cast of characters from all over the world, recently released Update 2.3 which added even more heroes. Below we check out some of the powerful new heroes joining the cast of this epic mobile RPG game. Among Oriental Legends, none have as much influence as Ancestor Xi. Known as the first emperor and the original ancestor of the Chinese people, Ancestor Xi has quite a legend to his name. Now Xi has come to Spirit Guardian and his power is everything the legends claim. His amazing Ultimate skill has the unique effect of splitting damage among your team, making it impossible for the enemy to burst down your fragile heroes! Casts a soul link on all allies that lasts 10 seconds. Any damage against a linked ally is divided among the team. Linked allies also gain immunity to poison, sunder, burn and freeze. Divine Art - Each time Ancestor Xi is attacked, there is a chance the damage is reversed and he is healed for that amount instead. The heal amount cannot exceed 3% of his max HP. Boast - Each time Ancestor Xi loses 10% of his max HP, he taunts his nearby enemies and greatly reduces their attack. Ice Maiden is an ice cold beauty and one of the most powerful frost mages in Tempest World. Using the cold as her weapon, Ice Maiden is easily one of the most powerful AOE strikers, with skills that inflict slow effects to gain uncanny control over the battlefield. Those who think they Ice Maiden is the typical mage who is weak in close combat will quickly find themselves frozen and helpless. Ice Maiden unleashes an expanding frost nova around herself that hits up to 4 enemies, dealing 200% damage and freezing them for 4 seconds. Freezing effects can stack. Core of Cold - Fires 5 ice shards at random enemies to deal damage and increase the damage they take. Mana Burst - When Ice Maiden takes damage she will bind her attacker and deal continuous damage to them. Passive effect : Removes control effects on herself every so often. Shadowsong is one of the greatest assassins from Tempest World. Using her agility and deadly daggers, she can take down even the biggest targets. Her daggers are poisoned to inflict many kinds of negative effects on her victims, while she gets stronger the longer she’s attacking. Shadowsong blinks to enemy with the lowest defense, to attack and fear them for 2 seconds, She gains control immunity for 4s, within the next 6s, increase crit by 30%, attack speed by 120% and gain 50% lifsteal effect, using ultimate damage by 30%, stacks 5 times. Shadow Dagger - Shadowsong throws a shadow dagger at the enemy with the lowest defense. All enemies in its path also take damage and have their movement speed reduced and damage taken increased. Serrated Blade - Gains increase Crit damage each time Shadowsong crits, effect lasts 5 seconds and can stack up to 3 times. Spartan was once a mighty warrior from Western Myth. As the commander of a great legion, Spartan achieved impossible victories on countless battlefields. However, the gods became jealous of his feats while Spartan began to view himself as a god, furthering incuring their wrath. He was struck down by the gods and lost everything. Now he is on a rampage to get revenge against all who had betrayed him. Just being near Spartan will have enemies taking burn damage from his unyielding rage. Spartan deals True damage (ignores defense) in a small area, and enemies hit are feared for 2 seconds. Spartan will gain a random amount of Rage as well. Godslayer - Spartan charges forward, knocking down all enemies in his path. This skill also gives Spartan damage reduction for a short duration. Fire Born - Spartan deals continuous burn damage to nearby enemies and gains 50% damage reduction every so often. However this mitigated damage is dealt back to Spartan once the effect ends. We hope players will enjoy these new heroes and discover new strategies to deploy. Please stay tuned to more news and updates for Spirit Guardian!